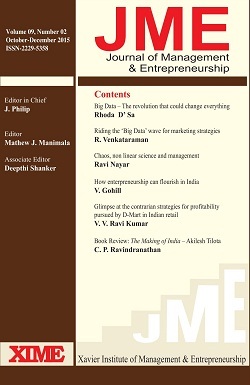 Journal of Management & Entrepreneurship (JME) was launched by Xavier Institute of Management & Entrepreneurship (XIME), Bangalore in 2006 as a tri-annual academic journal to publish research-based papers in management and related disciplines. The academic fraternity’s response to this initiative was quite positive and hence JME decided to increase its periodicity and made it a quarterly journal in 2007. Having served the academic community as a forum for publishing their research-based papers for a decade, JME has since 2016 embarked on a more rigorous publication regime, following the international standards for publishing academic journals, including the double-blind peer-review system for ensuring the quality of papers published. (jme.xime@gmail.com) & those related to subscription to jme@xime.org. © Copyright 2016 Xavier Institute of Management and Entrepreneurship. All rights reserved.